SHANGHAI (Reuters) - China has published draft guidelines to regulate the booming bicycle-sharing industry whose firms have raised hundreds of millions in dollars in funding but have cluttered up sidewalks with bikes. The rules aim to address congestion and illegal parking as well as safety concerns over users' deposits and personal information, according to the statement published by the Ministry of Transport. The rules are the first national attempt to strengthen oversight over the sector, which now has more than 30 bike-sharing services that allow users to find, unlock and pay to rent trackable bikes through smartphone apps. Industry leaders include firms Mobike and ofo, which have raised $665 million between them in their latest funding rounds. Their investors include Foxconn, Singapore state investor Temasek Holdings [TEM.UL] and Tencent Holdings. 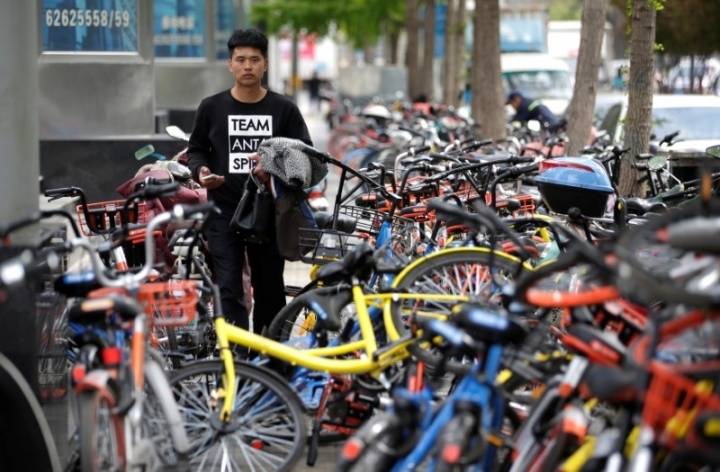 These firms have put more than 10 million bikes on the street in the year since the bike-sharing boom started, sometimes prompting police to move away bikes blocking the paths. The draft rules, for which the ministry is seeking public opinion until June 5, may require companies to establish user credit systems, dole out penalties for illegal parking, and bring in insurance for users. The bike-rental firms will also need to share real-time operating information with the local regulator, it said.